There are several sites around the web that do small mods on the MiniBrute, hinting at "whats possible" and leave it at that. Using them as inspriation which I thank them for, lets go. Disclaimer : just because you should know better... if you try to mod your unit you void the warranty. I'm not responsible if you damage your minibrute from either your own lack of skills, bad luck or that the info here is in any way not accurate. Do your own verification of accuracy. The starting point was simply going over the schematics and looking at the circuits. All over the place you will find patch points for pulling out or putting signals in. In a couple spots there are actually several points for adding several wires. 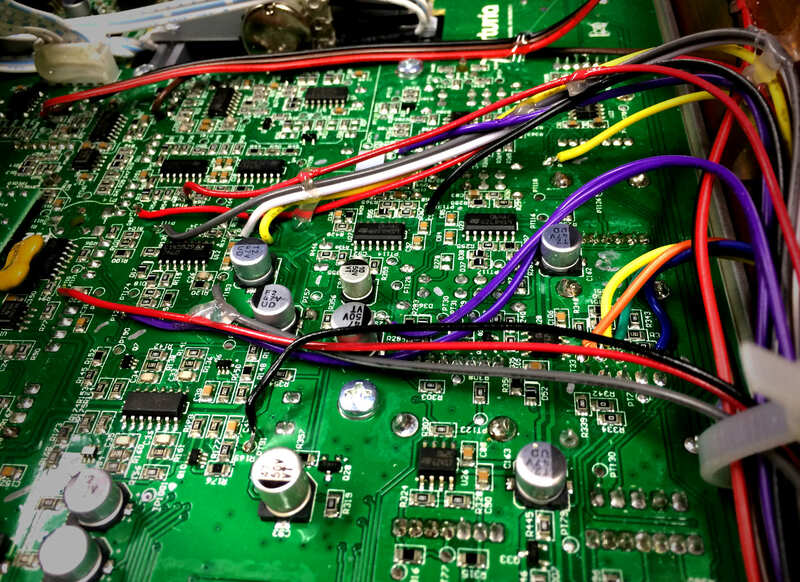 On the schematics page I've got a pretty complete list of every patch point of interest on the minibrute main PCB and what its for. Of course this unit being built with SMD components, those pads are small. Finding them on the boards can be a challange so instead use the PDF of the board layout. You can simply search for the point ( PT ) number and find it. Once you know where it is on the board layout its a lot easier to find on the actual board. I'd also reccomend using something like a silver or bright colored sharpie to make marks next to them once they are found so you don't waste time finding them again once its soldering time. My original plan was to access and bring out as many patch points I thought would be useful as possible. In this case I studied the schematics which often had very helpful labeling. In doing this it kind of forced me to build the patch points list in a spreadsheet. Going over the list, and being realistic about what was probably the best choices, I got my list down to just over 30 points ! It took a couple days overall to get this done. With this in mind I started to plan the actual build. I needed a lot of patch points - aka 3.5mm jacks to bring things in and out. I bought 2 lots of 20 jacks on ebay figuring that would be good. It initially was however it turned out that one batch of jacks was of better design and quality than the other. So buyer beware in what you buy and don't skimp out. You don't need fancy enclosed ones, but look for better quality open ones. The time effort here far outweight saving a couple dollars on poor quality jacks, or worse replacing them later. Once the jacks showed up they needed to be mounted some how. Jumping slightly ahead I was going to remove the keyboard. The reason I decided I wanted to remove the keyboard was to save some space as my plan was to use the Minibrute mainly for sequenced bass lines. I also knew I could use another keyboard via MIDI or MIDI->CV conversion on my beat step pro. So off with the keyboard. This yeilded a metal strip underneath the keyboard which matched in color to the top. Once I had the piece drilled with 30+ holes, I found it was simply too thick for the pile of 3.5mm jacks I'd bought on ebay. It also would of been a real pain to wire the way it wrapped around. While I could of removed the back lip, it would of been a tricky cut to do so I decided to pass on doing that. Ok mild panic and cussing at that wrong turn. Thinking about it a bit, I decided to use a strip of 1/8 thick X 1.5" wide aluminum to mount the jacks instead. Slightly larger than the original peice but it would fit perfectly into the new case I was working on. The jacks I had fit perfectly. The case was already in progress while I was waiting for parts to arrive. Using the original sides as a guide I simply went about 2" longer and about 1" taller than the orginal sides. I added appropriate dados for the jack panel on front and for the original case bottom on the back. This is basic box making. It wasn't too hard to use some 1/16" X 1/2" angle aluminmum to make mounting brackets for the inside of the case which I was able to screw the Minirbtue main top chassis right into. The original sides helped in figuring this out, and sliding the main chasis into the case gave me marking points where the brackets needed to go. The wood itself is an orange colored tropical wood ( paduk I think ) which I had already. A good cabinet maker's wood supply house will have all sorts of wood like this. The only thing is it will typically come in large boards. You'll need to be abe to cut it to size, don't expect a 1X4 ready to go where you can basically just cut the sides to length and go. The parts are easy to cut to size on even a small table saw. Cutting the shallow angle is a little more tricky and there are guides for doing this. If you aren't sure google some videos up showing experienced woodworkers doing cut as there are several ways to do it. I used a 90 deg peice of 3/4" plywood clamped up to my crosscut slide. A bandsaw would also work although the cut edge will need more sanding. If you lack the right tools or the shallow angle cut scares you, for a modest few dollar fee most supply places can cut and size it for you. Its one reason dealing with a small locally owned supplier is nice to work with. An alternative are the big chain building supply places which do have typical Oak and maybe walnut or cherry. A 1X4, 4" long is all you need so don't worry about paying premium pricing. Stay away from Popular - its a softwood and prone to tear out when you cut it. Its a major pain to work with. Once I had the case parts cut, I glued the case with epoxy rather than wood glue for more stabiliy. It was finished with several coats of clear gloss spray finish. The case was a week of spending an hr or so a day to build and finish. To Bring the cables out of the main chassis I drilled a fairly large 3/4 / 19mm hole. I put electrical tape around the edges of it as I didn't have a proper grommet which would of given me enough space. Good planning as it turned out to be a LOT of wire. 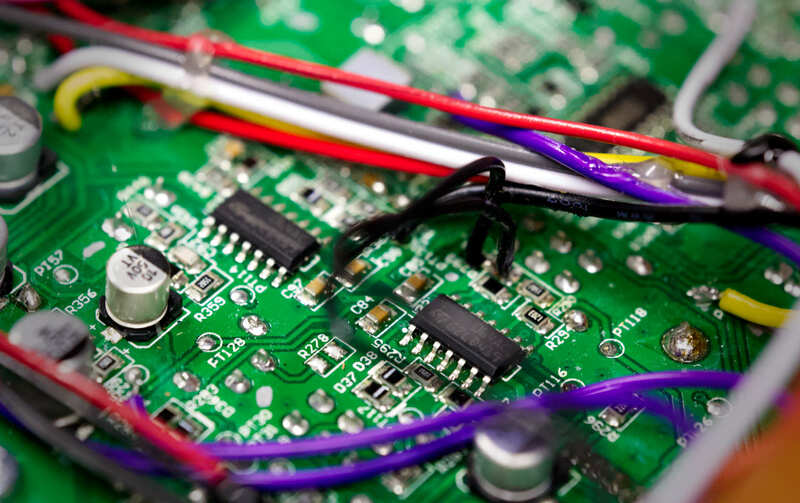 The first thing you'll need is respectable soldering skills and gear. A small tip iron with grounding and preferably adjustable heat level. Next is a lot of small gauge wire. I mean a lot of it. Each front to back run is about 12 to 18 inches long times 30 connections just to the jacks. Then more to the PCB pads. A few more if you want to wire a few switches in. Realisitically its a good 60 to 80 feet of wire that I used. The best thing I'd reccomend is get get hunks of rainbow ribbon cable. This will give you lots of colors and length. In general solid wire is much easer to work with for work like this. The ability to flex isn't really important for wire in this usage as it should stay put. In looking at the pics you will probably see quite a few places I secured the wires down with hot glue. Its perfect because it becomes solid quickly unlike alternatives like silicone that could take an hour to harden up. The next must have item is a headset magnifer. 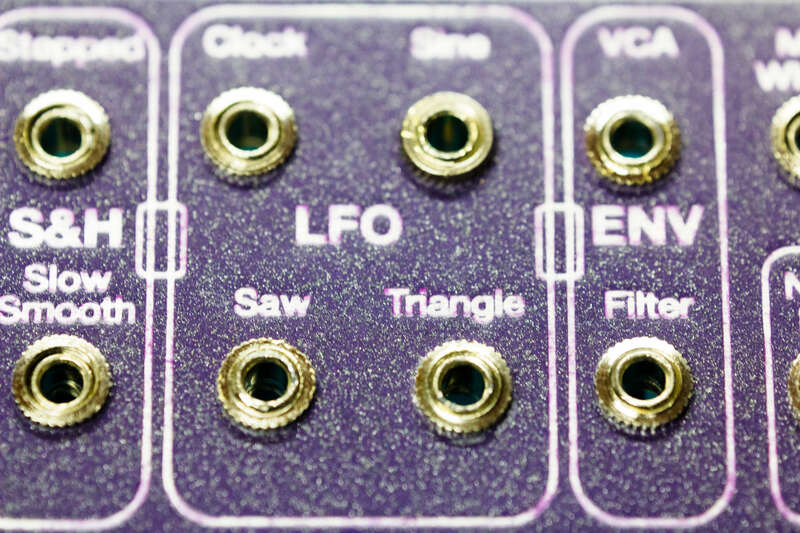 Even with the best eyesight you don't want you face inches away when soldering. 6X magnification will work fine. They don't have to be expensive or fancy. I built my buffer board on a generic PCB designed to take DIP IC's. I got several boards for around $10 on Ebay. I cut this down from the larger board with score and snap once I knew how much space I needed. Since the circuit I was doing was simple enough I took care of power to the IC's and basic connections on the bottom side entirely. Be careful of solder bridges ! The magnifers will help you spot them and an xacto knife will help open any small ones. 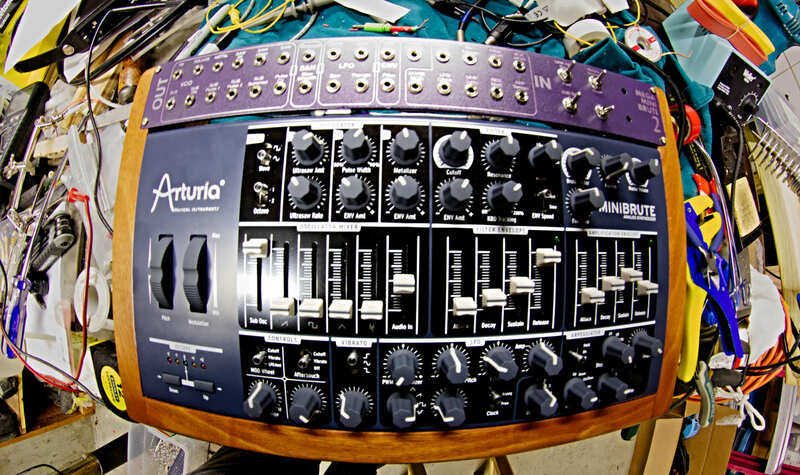 To mount the boards I lined up holes on my board with those on the main Arturia analog board. I got some nylon tube spacers locally and ran longer coarse threaded screws through them to the original case holes. It was pretty simple and easy way to mount everything securely. There are many choices here but I went with TLO84's here. Better slew rates seemed like my tonal choice here. TLO74's would also probably work fine too and its what some other modders have picked. Pricewise not much difference. I bought 10 on ebay for not much along with sockets. The TLO84s I bought had slightly longer cases than expected. Being as I was doing buying parts a bit out of order, I had already soldered the sockets in without thinking of the chips being slightly long until of course I got the chips. I had trimmed the board based on having 2 rows of 4 chips. The problem is the IC's where longer than the sockets by about a 1/2 pin width. I got some sand paper out and sanded the ends of the IC's down until they where the right length. I knew with these chips I could get away wtih doing that. I painted the sanded ends with a dab of nail polish for saftey. This let me fit more IC's into a tighter space.You can't always get away with doing something like this, but this time I did. I also didn't use all the sockets. I left a spare for just in case I decided to add a few more patch points down the road. Wire was another thing. You see I have lots of different colors. That really helps when building and troubleshooting now or in the future. I didn't pick any particular color scheme. What I did to get all those colors was find solid conductor rainbow ribbon cable. It'll search right up on ebay. I bought a couple short 48" pieces. I then pealed wires off the cable as I needed them which kept me using different colors. If I did keep one standard it was Red for positive power and Black for Negative ground. The basic panel is a peice of 3.5mm thick 1.5" wide aluminum. I made it a 1/2" wider on both ends than the minibrute's top. The wood case had rabits cut to match by hand with a chiesel. This wasn't worth setting up a power tool to do. The layout is shown in the case EPS file on the schematics page. I painted the panel with a purpleish blue Rustoluem paint I found in the local mega building supply store. Turns out it was actually a pretty decent match to the Arturia color. I put one initial coat of paint on and let that dry. I then did a second coat. While the second coat was still wet, on the top, I misted over some dark metallic paint. This gave it a little sparkle and depth. A little bit is all you need. Once this dried, a coat of semi gloss clear was put on. Once the panel had dried for a couple days I brought it over to a local sign engaving place wtih a laser engraver. The laser itself was only 30W which is a bit under powered these days. The first pass barely took the clear coat off leaving the flat paint underneath. After 3 passes the metal was showing through in a grity sort of way. I could of stopped here but instead let them take a few more passes. I think they took a total of about 10 passes on the panel. There is still some paint left, but overall it looks cool. In shopping around, you might want to ask how much power their laser has and look for one with 50-100W of power. This will reduce the number of passes required. Once I got the panel back I gave it another coat of semi gloss clear to seal the look of the bare metal. At this point I drilled the panel out. While this may seem out of order, it meant that my holes had no paint in them. Since the holes where slightly tight for the jacks it made for a soild ground connection for each jack. This way I didn't have to solder all the ground lugs up. I also drilled the holes for the 4 switches. You could also drill the panel first prior to painting too with the expection you'll need to clean the holes out before assembling the panel. If I had a redo on this, I'd add drill marks to the layout. I used the op amps as unity gain simple buffers. This prevents loading on the internal ciruits which could lead to unexpected results when patches are made. This also offers some protection to both the internal circuitry and anything thats connected. The only downside is that you can't use the patch points in reverse : using an input as an output since the start of one ciruit is the end and output of another. Since there isn't much to this circuit, I soldered a jumper from the - leg to the output pin for each op amp. Other than that it was a matter of running the input jack ( or output) to the + pin and connecting the output of the op amp to the appropriate solder pad input ( or outout jack). Repeat as approriate 30 times. Techincially this left 2 op amps unsed. If power consumption is a concern you can solder the + to ground. 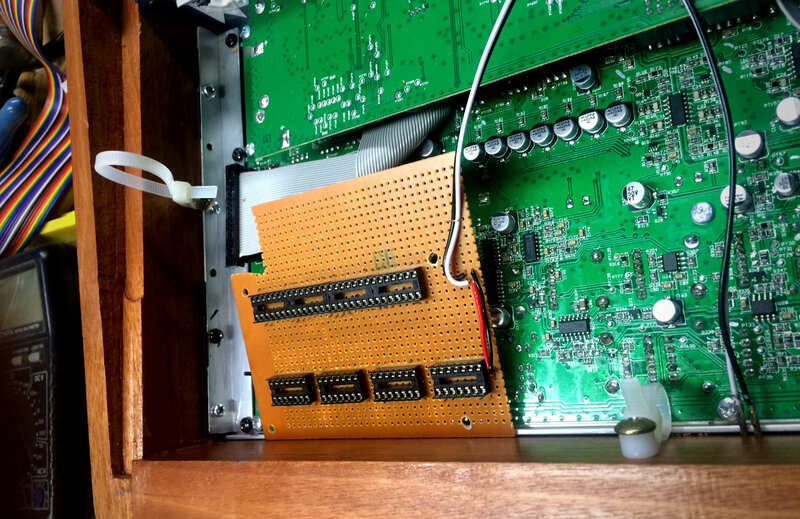 The buffer board got its power from the connector board on the back of the MiniBrute. There are a couple points to get power. There was one point where I couldn't decide which pad on the minibrute PCB to use. This was concerning the SAW alt circuit. There are pre and post ciruit pads. Having run out of jacks I instead put a SPDT switch in instead to select between the two points. Each position produces a different result so its a fun option to have. Likewise if you aren't sure you could air wire a switch to play with before committing.... or just go with the switch and enjoy another option. Yet another switch swaps a capacitor in the Vibrato circuit to change from stock to a value of 1uF to 33nF that adds higher occilation freqs. This required removing the original SMD capacitor very carefully. Then I ran an in and out wire to the switch and adding two caps soldered onto the switch itself : one that was the same as the stock value, and a smaller one to produce higher occilation in the circuit. It works ok for interesting results depending on what sort of sound you have running. The cap to swap is C83 on the main board. The pic shows the two wires where the cap was orginally. I was pretty careful about the entire build. When I got my buffer board initially built with sockets in place I connected it to an external power supply first. Besides checking for shorts before powering, I checked that each IC socket had correct power. All good. When I finally had things more or less done I finally went for a full unit power up. It worked ! Ok no blue genie at least. Testing showed it made sound but I had some odd ground problem. I removed the bottom of the unit, moved wires around, it was gone. Never came back so I guess I'm good. Patch points where checked one at a time. At one point I found I reversed two jacks top to bottom and fixed them. In use I took a 3.5mm patch cable and added a 1/4" TRS jack to the end of it. Using this cable I could take the various ocillator outputs and route them to the external in on the back. This has worked great. Likewise I made another cable but 1m long to connect other sources like the headphone output of my audio interface to feed signals back in for feedback modulation from this unit or a drum machine. An oscilloscope is nice for troublshooting or seeing what is going on with circuits but its not a requirement. 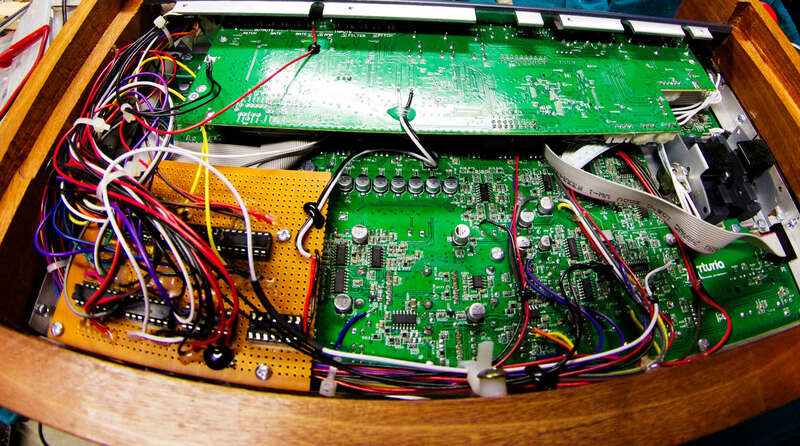 Only a decent digital VOM would be required.When I built the buffer board I first wired power to all the IC sockets. With the VOM I tested all the pins to be sure they were connected correctly. Test for shorts or open connections as appropriate prior to power up.